This book is a feature of the Gazette in Cedar Rapids, Iowa. 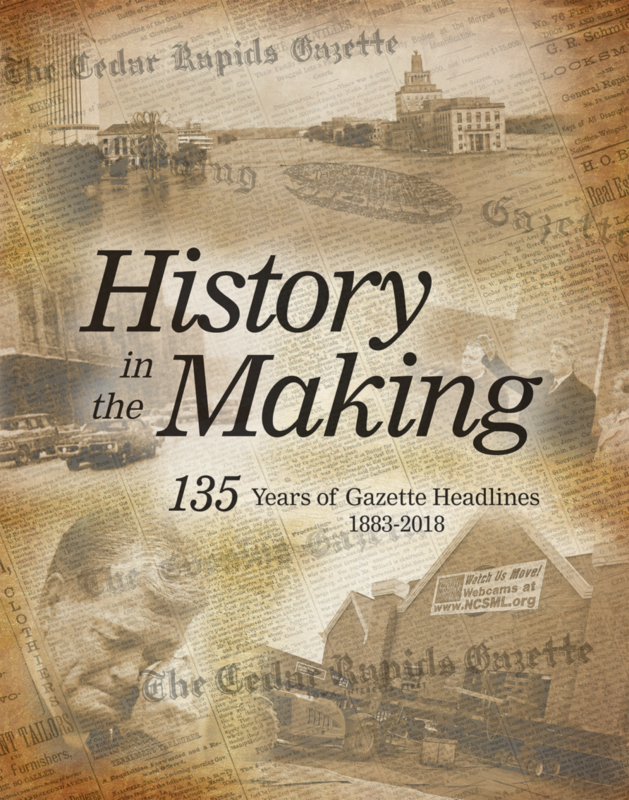 It was created to commemorate 135 years of the Gazette, by publishing a book of 135 of the most memorable and important Gazette Covers. Many of these covers were pulled from old scans that had to be cleaned up and in some cases old photos were found to replace those that had been lost to bad scanning or archiving. I chose a minimalistic timeline page footer with the year and page information at the outside of the page along the timeline in order to focus the page on the cover itself. We used color pages where they could be found, but many of the pages were scanned and archived in black and white. For the cover, I took the oldest of the pages, and used a parchment type background to give the impression of an old, yellowed newspaper, and included some of the top photography as well as various historical mastheads from the Gazette photographers over the years and made them into a collage. The back cover included a historical photo of the Gazette building and information about the book. The book was well received and sold out it’s first printing in the first couple weeks of availablility.